an enzyme present in lymphocytes that is elevated in various diseases such as cirrhosis and polycythemia and in certain infections. It is measured in the blood to detect these disorders and to differentiate chronic myelogenous (myelocytic) leukemia from leukemoid reactions. Normal amounts of this enzyme in a smear of fresh venous blood are 50 to 150 units. Also called neutrophil alkaline phosphatase. Synonym/acronym: LAP, LAP score, LAP smear. To monitor response to therapy in Hodgkin’s disease and diagnose other disorders of the hematological system such as aplastic anemia. Whole blood (1 mL) collected in a lavender-top (EDTA) tube. (Method: Microscopic evaluation of specially stained blood smears) 25 to 130 (score based on 0 to 4+ rating of 100 neutrophils). 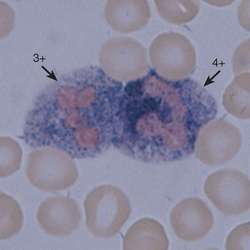 Alkaline phosphatase is present in the cytoplasm of neutrophilic granulocytes from the metamyelocyte to the segmented stage of development. The study involves counting 100 neutrophils from a stained smear. Segmented and band forms are counted; eosinophils, basophils and other immature neutrophil forms are excluded. The reaction is subjectively scored from 0 to 4 based on the number of stained granules observed in the counted cells as well as the intensity of the staining. The number of cells counted is then multiplied by the score to arrive at the result. Leukocyte alkaline phosphatase (LAP) concentrations may be altered by the presence of infection, stress, chronic inflammatory diseases, Hodgkin’s disease, and hematological disorders. Low levels are associated with the presence of leukemic leukocytes while high levels are present in normal white blood cells (WBCs). The test has been used for many years as a supportive test in the differential diagnosis of leukemia. As time from its inception has passed, and other technologies such as polymerase chain reaction (PCR) and FISH (fluoresence in-situ hybridization) have emerged, the LAP assay is used less often. The current World Health Organization classification of chronic myeloproliferative neoplasms does not use the LAP score; rather a consensus of experts have developed international criteria such as morphology, immunophenotype, genetics, and clinical features. PCR and FISH technologies are used to evaluate blood or bone marrow specimens collected in a sodium heparin collection tube. The testing can be used to identify BCR/ABL-1 or JAK2 gene rearrangements that assist in the classification and treatment of hematologic conditions such as CML, polcythemia vera, and other myeloproliferative neoplasms. Conditions that result in an increase in leukocytes in all stages of maturity will reflect a corresponding increase in LAP. Drugs that may increase the LAP score include steroids. Patient Teaching: Inform the patient this test can assist in evaluating for blood disorders. Obtain a history of the patient’s hematopoietic and immune systems, symptoms, and results of previously performed laboratory tests and diagnostic and surgical procedures. Instruct the patient to avoid exposure to infection if WBC count is decreased. Related tests include biopsy bone marrow, calcium, CBC, CBC platelet count, CBC WBC count and differential, CT thoracic, gallium scan, Ham’s test, Hgb electrophoresis, hemosiderin, IFE, immunoglobulins, iron, laparoscopy abdominal, liver and spleen scan, lymphangiogram, mediastinoscopy, phosphorus, and sickle cell screen. Refer to the Hematopoietic and Immune systems tables at the end of the book for related tests by body system.